How to have a quiet line classroom management materials to help you get a talkative class quiet during lineup for fast transitions and also quiet while walking in line that goes along with my brand new blog post: How to Have a Quiet Line Ideas and Activities! These are just materials I showed in my post in case you want them too and already made for you. There are no worksheets or student activities included. 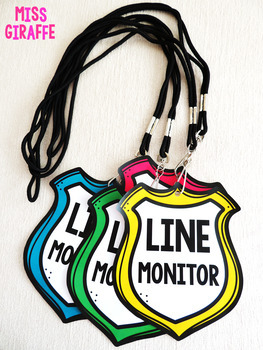 This Quiet Line Pack includes the Line Monitor badges in 7 colors and in black and white if you want to color it yourself. 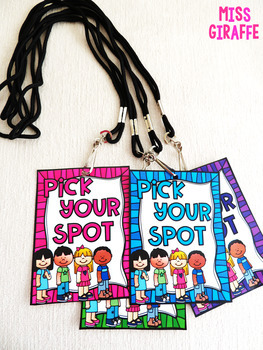 It also includes 4 colors of the Pick Your Spot pass in 2 varieties. Kids LOVE getting to be the Line Monitor! It is a favorite classroom job and is so awesome for keeping your line quiet! It is a lot like the Quiet Manager I discuss in my 25 Chatty Class Classroom Management Strategies for Overly Talkative Students blog post! If you love this, you'll definitely love my Chatty Class Classroom Management Tools for Talkative Students pack which has all the Blurt Beans, Blurt Cubes, Blurt Desserts, Students vs. Teacher, Animal Voice Level Chart and Posters, etc. materials in it! For this pack, please READ THE HOW TO HAVE A QUIET LINE BLOG POST BEFORE BUYING this to make sure you want the materials! 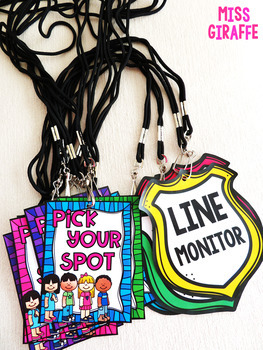 :) There are no student worksheets or activities in this pack - it is simply the Line Monitor and Pick Your Spot passes for you to print and put on lanyards. I hope you love these!!! !